Environment Minister Lord de Mauley visited the New Forest during National Parks Week and saw a showcase of life in the National Park. Lord de Mauley, Parliamentary Under Secretary of State for natural environment and science with responsibility for National Parks, heard about the National Park Authority’s work to encourage green transport in the Forest, reducing car journeys while helping to protect the iconic landscape. Julian Johnson and Chief Executive Alison Barnes. 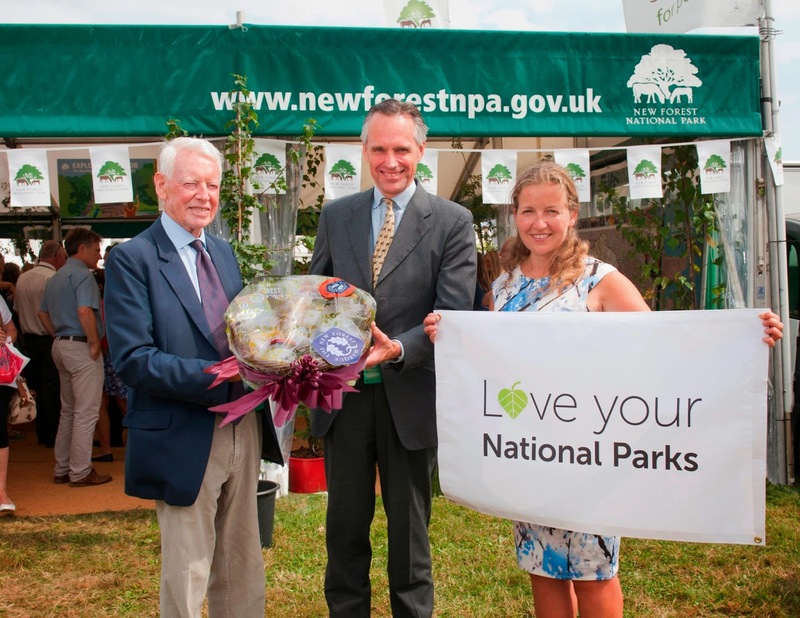 During his visit to the New Forest Show last week (31 July) he met business and community leaders who support National Park projects such as the New Forest Tour, which last year saw a record 40,653 passenger journeys on the three open-top bus routes and contributed £660,000 to the local economy. Alison Barnes, New Forest National Park Authority Chief Executive, said: ‘We were also able to tell the Minister about the special qualities of the New Forest – over half of the National Park is designated as being internationally-important for nature conservation – and how it is vital we work together to protect it for the future. Natural Environment and Science Minister Lord de Mauley, said: ‘The New Forest National Park is among our greatest natural assets, and a huge contributor to the local economy and tourism industry, which is why it’s important to celebrate its success. The Minister was presented with a hamper of New Forest Marque local produce. Supported by the National Park Authority, the New Forest Marque scheme has around 130 members and gives local businesses a distinctive ‘New Forest’ banner to sell their goods. He also visited the Local Food and Farming Area at the Show to meet some of the producers. National Parks are our national Asset that we can't deny. It provides entertainment resources and contributes in our economy. It plays a vital role in the tourism department. I visited all over the world in last week I have visited yellowstone chinese tour with my friends. Here I have enjoyed a lot of things it is an open sources of fun. I recommend to the other must plan your next visit there.